How to plug or check your cables? Once your Proximus line has been activated, you can connect the cables between the different devices. Plug your telephone and modem into the telephone socket, plug your TV into the decoder and plug your computer into the modem. How do you connect the cables to your b-box 3V+? Comment contrôler les câbles de votre modem b-box 3V+ ? Cette vidéo permet de contrôler si les câbles qui relient votre modem b-box 3V+ à vos autres équipements sont correctement connectés. How do you connect your Proximus devices to use your fixed line, television and Internet? First check the connection between your modem and the connection socket or fiber modem (if you have one). How are you connected ? If necessary, first prepare the splitter and the Proximus connection socket. In most cases, there is already a Proximus connection socket on your premises and you don't have to do anything. If there is no Proximus connection socket on your premises, prepare your wall socket by plugging a Proximus splitter into it. There are two options: either you have a single 5-pin socket (view manual in French or in Dutch) or you have several 5- or 6-pin sockets (view manual in French or in Dutch). In case of doubt, choose the second option. Do you have a fixed line? If you have a traditional fixed line, plug the telephone jack into the Proximus splitter. The splitter may be different from the one in the figure below. If you have a fixed line via the Internet, it depends on the telephone you are using. If you have a traditional telephone, plug the telephone jack into the green port (Phone 1) of your modem. If you have a new IP telephone, plug the telephone jack into one of your modems yellow ports. Traditional fixed line or fixed line via Internet? You’re not sure if you have a traditional fixed line or a fixed line via the internet? If you have a fixed line via the internet, ‘Voice over IP Telephony’ will be indicated next to your telephone number on your bill or payment statement. Connect the modem to the Proximus splitter. For this, connect the blue cable (or black cable with blue ends) to the blue port of the modem. Connect the modem to the fiber modem. For this, connect the cable with red ends to the red port of the modem and to the port of the fiber modem. The connection depends on your phone model. Connect your phone cable to the green port (Phone1) of your b-box 3V+. If the green port seems too small, do not force it. Then use one of the yellow ports. If no cable is included with your phone, consult your phone's documentation to connect to your 3V+ b-box. Plug the modem into an electric socket and switch it on. Always use the power cable received with the b-box. Never use the power cable of an old b-box! The LED will light up. If it doesn’t, check that the switch at the back of the modem is in the On position. Your modem will be automatically configured and updated. This takes max. 30 minutes. The LED light or will blink and, once your modem is ready, will remain lit. Do you have Proximus TV? Once the LED light or is on, you can connect the television. Comment contrôler les câbles de votre décodeur V5 compact ? Cette vidéo permet de contrôler si les câbles qui relient votre décodeur V5 Compact à vos autres équipements sont correctement connectés. Comment contrôler le câblage de votre décodeur V5 ? Si le décodeur ne reçoit plus le signal TV via le modem, ou s'il est mal connecté à votre télévision, et que vous constatez cela par un écran noir ou un message d'erreur sur votre TV, vous pouvez contrôler les câbles en suivant cette vidéo après avoir procédé au redémarrage du décodeur. Comment contrôler le câblage de votre décodeur V6 ? Si le décodeur ne reçoit plus le signal TV via le modem, ou s'il est mal connecté à votre télévision, et que vous constatez cela par un écran noir ou un message d'erreur sur votre TV, vous pouvez contrôler les câbles en suivant cette vidéo après avoir procédé au redémarrage du décodeur. Do you have a Wi-Fi Bridge? See how to install your Wi-Fi Bridge. Do you have a Wi-Fi Extender? See how to install your Wi-Fi Extender. Do you have a PLC-adapter (Devolo)? See how to install your PLC-adapter (Devolo). Do you have a Ruckus? See how to install your Ruckus. Don't have a Wi-Fi Bridge, PLC-adapter (Devolo) or Ruckus? Follow the three steps below and, for more information, see how to install Proximus TV. Connect the decoder to the modem by plugging the black cable with the yellow ends into one of the yellow ports of the modem. Then connect the decoder to the television with an HDMI cable (for HD quality) or a Scart cable (for SD quality). Finally, plug the decoder into an electric socket and switch it on. Once the LED light is on, your Internet connection is ready. Connect to your Wi-Fi network (when the LED light is on) or connect the computer directly to the modem. For this, plug the black cable with the yellow ends into the Ethernet port of your computer and into one of your modem’s yellow ports. Comment connecter un PC via un câble à mon modem b-box 3 ? Cette vidéo explique comment connecter un PC à son modem b box-3 Proximus en utilisant un câble Ethernet entre les deux. Your fixed line, television or Internet connection are now ready for use. How do you connect the cables to your b-box 3? 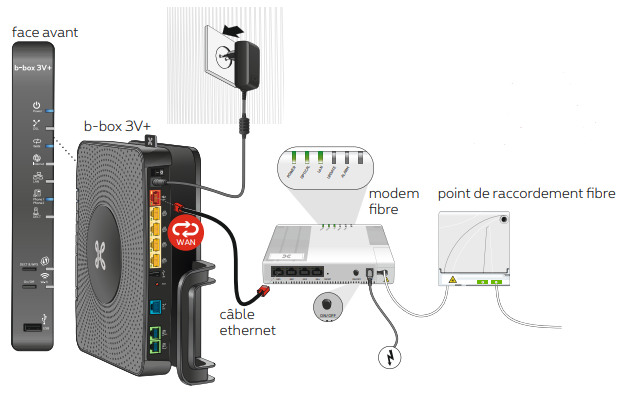 Comment contrôler les câbles de votre modem b-box 3 ? Cette vidéo permet de contrôler si les câbles qui relient votre modem b-box 3 à vos autres équipements sont correctement connectés. If you have a fixed line via the Internet, plug the telephone jack into one of your modem's yellow ports. Plug the modem into an electric socket and switch it on. Always use the power cable received with the modem. Never use the power cable of an old modem! The LED light will blink and, once your modem is ready, will remain lit. Once the LED light is on, you can connect the television. Do you have a Wi-Fi Bridge? See how to install your Wi-Fi Bridge . How do you connect the cables to your b-box 2? If you have a fixed line via the Internet, wait until the LED light is on, then plug the telephone cord into one of the modem's green ports. For this, plug the blue cable into the blue port of the modem. Plug the modem into an electric socket and switch it on. The LED light will go on. If it doesn’t, check that the switch at the front of the modem is in the On position. Your modem will be automatically configured and updated. This takes max. 60 minutes. The DSL LED light will blink, and once your modem is ready, it will remain lit. Do you have Proximus TV?? Connect the decoder to the modem by plugging the grey cable into one of the grey ports of the modem. Then connect the decoder to the television with an HDMI cable (for HDTV quality) or a Scart cable (for SDTV quality). Once the LED light is on, your Internet connection is ready. Connect to your Wi-Fi network (when the LED light is on) or connect the computer to the modem securely. For this, plug the yellow cable into your computer's Ethernet port and into one of the yellow ports of the modem (PC1 or PC2 port).